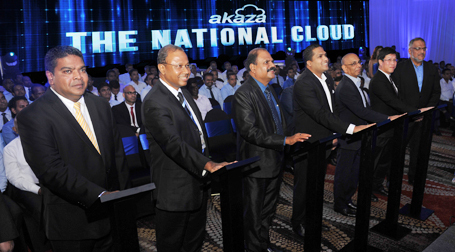 Sri Lanka Telecom (SLT) launched the country's National Cloud, Akaza, raising the bar in cloud computing in Sri Lanka. Akaza provides end-to-end cloud computing services enabling business organisations with enhanced agility, quick service delivery and cost efficiencies while providing maximum ROI and improved scalability. Akaza's technology integrates all its cloud services including IaaS, STaaS, PaaS, DaaS, SaaS and CaaS with the business management platform of corporate enterprises. Effectively, a gamut of services ranging from infrastructure to software can be accessed by a self-service catalogue online, centralising user management. The need for manual intervention in the form of technical support for provision of services has become obsolete thereby empowering the user. Akaza cloud hosted locally in SLT's state-of the art Data Centre can be used to store and access data by remote means. Group Chief Executive Officer of SLT, Dileepa Wijesundera said, "Akaza Cloud solutions provide the next generation of computing facilities to match increasing globalisation and performance needs of businesses." "Akaza Cloud solutions will definitely empower valued enterprise clients to focus on strategic directives of their core business by minimising their daily fire-fights on hardware, software, infrastructure and applications to help broaden their business horizons," he said. "Customers could exploit the new digital economy by exposing software and services via the cloud to their end users and customers," Wijesundera said. Akaza Cloud Portal helps SLT to build a 100% fully automated orchestration system which can orchestrate hardware infrastructure to third party multi or single tenanted software application vendors. The portal or the CPBM hosts product catalogues for each product category including infrastructure, software and storage. Once a customer is logged in to the portal he can view all his subscriptions, billing information and the health of the services. Akaza is flexible and scalable, enabling customers to scale their subscriptions.